An informal meeting of the heads of state and government of BRICS member states (Brazil, Russia, India, China, and South Africa) took place in Hangzhou before the G20 summit on September 4, 2016. 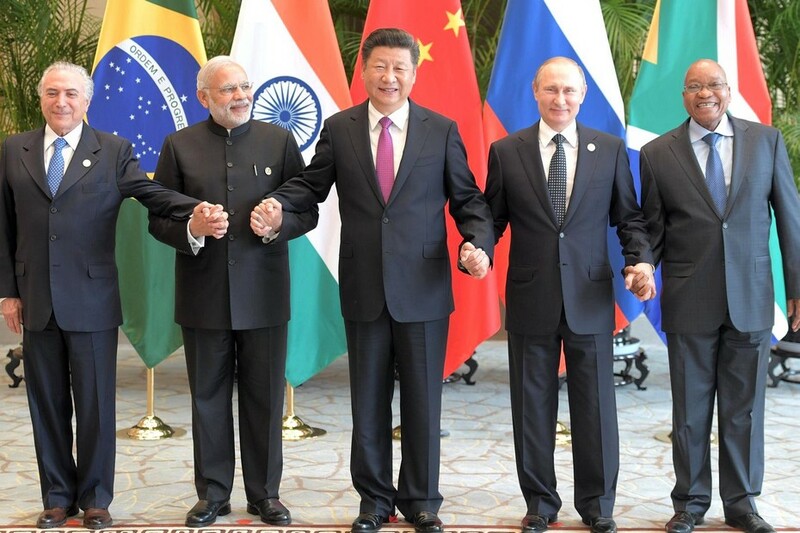 BRICS leaders discussed the cooperation within the association and the agenda of the upcoming G20 summit. President of Russia Vladimir Putin sad: “We know that on the basis of the Strategy for BRICS Economic Partnership adopted at the last year’s BRICS summit in Ufa, Russia, new large-scale joint projects are being prepared for launch, primarily in technology, industrial cooperation, energy, and agribusiness. We intend to expand contacts in other areas as well — in science, education, culture, on issues of social policy, healthcare and sport. We support cooperation between our parliaments, regions, trade unions, youth organizations and civil societies. Colleagues, we can see that contradictions in the world are indeed escalating. The rise of inequality between rich and poor nations is growing, the struggle for resources, for access to consumer markets, for control of transport arteries is becoming more intense. This is the backgrounds for the growing potential for conflict, as hotbeds of tension continue to multiply. My Brazilian colleague has just mentioned the long crisis that has engulfed the Middle East and North Africa. Civil wars instigated from abroad, the disintegration of government structures in Iraq, Libya (which President Zuma spoke about with concern) and Yemen, have turned this region into a place of chaos and a foothold for international terrorism which troubles all of us, causing an uncontrollable wave of migration. The expansion of ISIS and extremists of all stripes united under its banners has become a real security challenge for our countries as well, including Russia and its southern borders. The most dangerous situation is in Syria, which has already been discussed here. This is why we responded to the request of the legitimate, let me stress, the legitimate government of that country for assistance in the fight against terrorist groups. The Russian Aerospace Forces have dealt a heavy blow to the terrorists and their infrastructure, and have preserved Syrian statehood, which I think is absolutely vital. Together with other partners we managed to enforce a ceasefire in some regions of Syria and to launch inter-Syrian talks, because ultimately this sort of conflict can only be resolved by political means. We are confident that terrorist threats can only be countered by uniting the efforts of all interested nations. In general, the international community needs to work together to solve other complex problems, including those facing the global economy, as Mr Modi said, and Mr Xi Jinping as well. Unfortunately, the world economy has still not overcome the effects of 2008–2009 financial crisis, and global growth is still uneven and very fragile. According to forecasts, growth is unlikely to reach the pre-crisis level before 2019. Among the limiting factors is the volatility on foreign exchange and commodity markets, the lack of coordination of monetary policies, and the high debt levels in developed economies. In this regard, we support the priorities of China’s G20 presidency, aimed at stimulating the global economy – especially through the introduction of modern technologies. We welcome Chinese President Xi Jinping’s intensive work to prepare this G20 Summit and its substantive package of final documents. It is encouraging that many of them build upon the G20 agreements made in the course of our joint work in St Petersburg, Russia. It is important to strengthen our countries’ positions in the global financial system. I would like to congratulate our Chinese partners on the Special Drawing Right basket being expanded to include the Chinese yuan from October 1, 2016. The BRICS states have already increased their total share in the IMF capital to 14.89 percent, very close to the blocking threshold of 15 percent. And they certainly need to continue in this direction, advancing the reform of the IMF. We need to make the BRICS Pool contingent of foreign exchange reserves and the New Development Bank fully operational (here I totally agree with my colleagues), to adopt the bank's strategy, to provide loans in local currencies, and to begin financing specific projects. We are greatly concerned about the WTO situation, which was also mentioned here. That organization is losing credibility, losing its status as the only universal negotiating platform for the development of global trade rules due to the stagnation of the Doha Round. As a result, various private associations, such as the Trans-Pacific Partnership and Transatlantic Trade and Investment Partnership, are gaining momentum; they seek to replace the WTO rather than complement it. We see this as a response by some of our partners to difficulties they encountered in the course of WTO negotiations. But this is not the best way to solve problems. The best way is to negotiate and reach a compromise. Russia calls for the harmonization of regional economic formats, based on the WTO rules and principles, the principles of transparency and respect for each other's interests. It is in this spirit that we are shaping the Eurasian Economic Union’s activities and negotiating the linkage of the Eurasian Economic Union (EAEU) and China’s Silk Road Economic Belt.